Each BK® Kids Meal comes with its own Neopets toy, collectible box and sticker sheet. 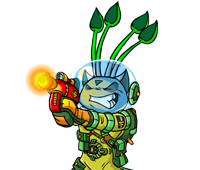 Be sure to check your Neopets collectible box from BURGER KING® for a Virtual Prize Code. Enter it below to claim your virtual prize! You must LOGIN or SIGN UP to redeem a code! Questions? Click here.Promotion ends 9/28/08. 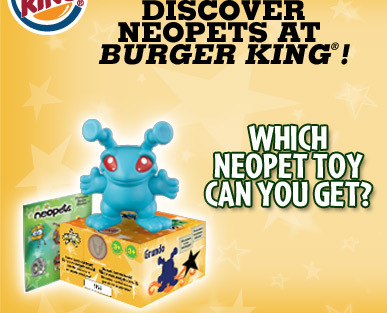 With the purchase of each BK® Kids Meal, you can receive a Neopets toy. One toy per Kids Meal. At participating restaurants. While supplies last. The BURGER KING logo and trademarks are used with permission of Burger King Brands, Inc. All rights reserved.